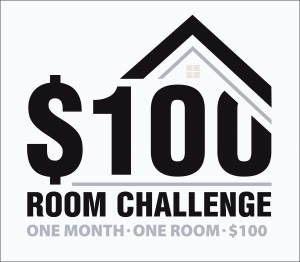 Welcome to the Reveal of $100 Room Challenge, if you are just joining us this is the final product of a 5 week journey and $100 budget. These are just a couple of the before pictures, just so you can remember how the room looked when we started. Pretty much a blank slate no paint, no color story, no personality at all, just still a gray builder’s grade bathroom. Shopping your home is one of the easiest way to freshen up a space. You may have things in other rooms that will work perfectly in your new space. 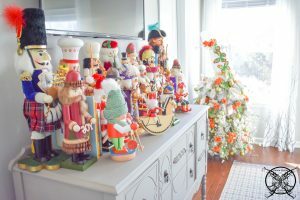 Sometimes these are things that may not normally be in a public area or maybe they are in your personal bedroom or bathroom, and no one has ever really seen them. 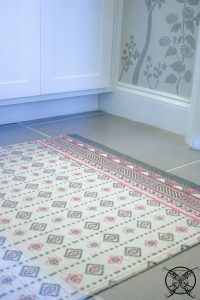 For example, this rug seen below was used in one of our guest rooms. 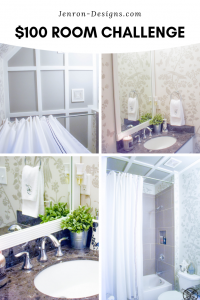 However, that room is currently being re-designed and the colors no longer work, so it was free to be used in this bathroom; which worked perfectly with the fact it is directly off of my office that already has coral accent in it, seen in the third picture. 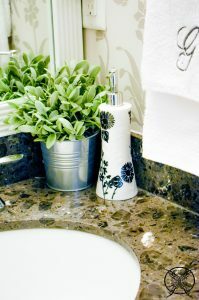 You may also notice the vase on the second shelf on the left in the office was also used here in the bathroom as well. 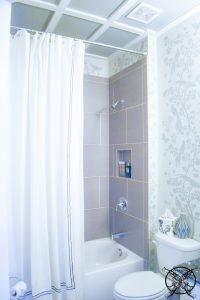 To be honest, you do not even miss it on the shelf, but it really makes a big difference in the smaller bathroom space. 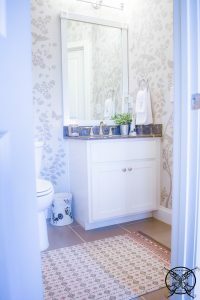 Again, this is how shopping your own home can really help you to design your own space on a budget. I have now placed this piece somewhere it can be seen as a focal, and not just as a space filler on the shelves. 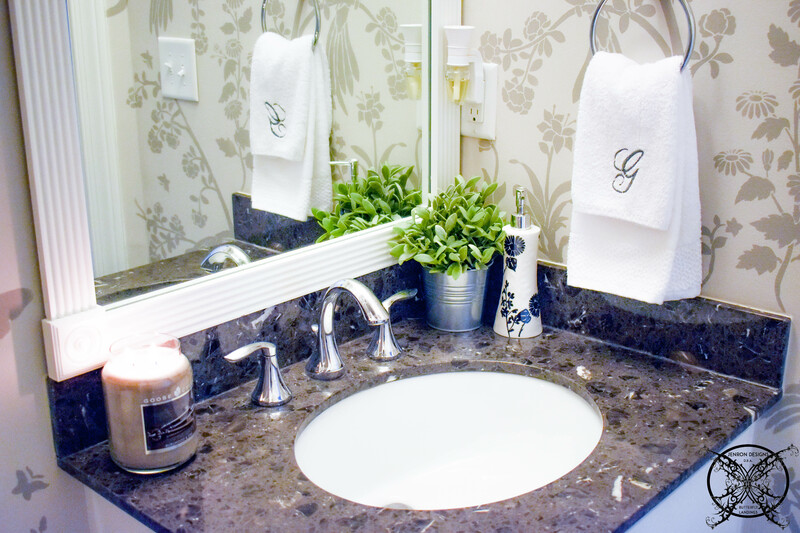 I also always love to add something green into bathroom spaces whether it be a living plant or, if your bathroom does not get natural light like this one, a faux plant will do the trick too. These great greenery plants from Ikea are perfect and I tend to move them all over the house since they are so versatile and inexpensive. I highly recommend picking up sets of 3, next time you are near an Ikea, they really are one of my go to decor pieces in a pinch. I am always on my soap box about proper lighting in a space, and I guess that is because that is what I live with. For those of you that do not know what Ron’s day job is, he works as an electrical engineer and primarily designs lighting and power plans for large scale commercial spaces. So that being said, you know that our home will be well lit, LOL. 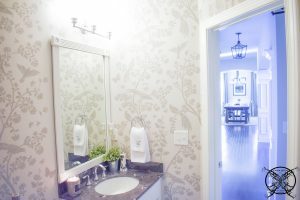 While we do disagree on the esthetics of the actual fixturing, as any good interior designer and electrical engineer would, we do always agree on that the rooms need to be well lit with dimmable fixturing and proper lumens. Since we were not going to have a budget for that in this space with this project, we opted for a good old fashion trick which was flipping the fixture. While this maybe a small change and cost nothing but a little time to do, you can see it was very effective because of how the light is now being distributed. Funny story…. when we first built the house I actually asked for the fixtures to be installed with the globes facing up as they are now, for all my bathroom lights. 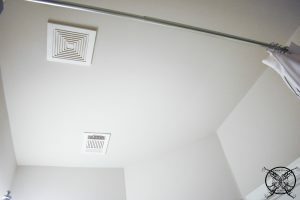 They were all installed with the globes facing down because this is how the they are shown to be installed, but they are actually a universal light fixture and can be installed either direction. Now here we are flipping it over, go figure. Okay, so one last funny story about our renovation. Always make sure that when you put a room back together you check everything twice. Can you tell what is wrong with this picture below? Well, in our rush to get the bathroom put back together before we had some guest over to our home, Ron inadvertently installed the door knob back on backwards. 😯 So when our guest came over, the lock was not on the inside of the room, but on the outside. 🙄 I think I made some joke about locking people we don’t like in the bathroom, which is completely untrue…. 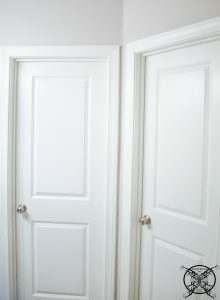 since there are two doors, and only one was backwards. Anyways, we all had a good laugh and got to watch Ron fix a door, you know a typical party trick…. here is your complimentary DIY door tutorial with coffee and dessert. I mean, I personally can’t think of worse places to get locked in, at least it was after the renovations and you had something pretty to look at….LOL. 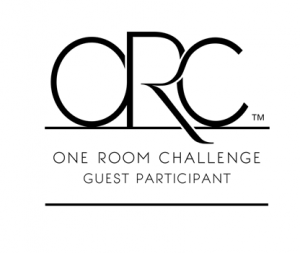 Be sure to see how my friends $100 Room Challenges turned out too. I know I for one am so excited to see everyones projects from this season! There is noticeably a lot of design information here to comprehend. Plus you’ve made certain that all these nice points also are functional too. 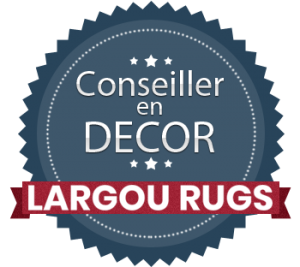 I stencils are sometimes expensive and it is quite hard to find a good bargain if you don’t search heavily for a good deal but this is a beautiful room. Bravo! What a beautiful transformation – everything from the ceiling to the walls to the accessories – just lovely. 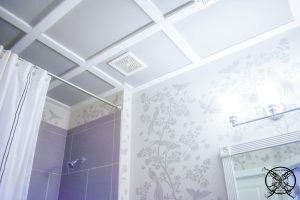 It’s amazing how that stenciling really changed the whole look of the bathroom, add to the amazing ceiling details and you have a fantastic makeover. Lol Erin…. 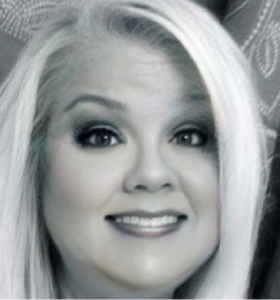 I know I was so embarrassed about the door lock, I just thought wow… now that is real life for you, and you can’t make that stuff up ha ha ha ha. Thank you so much for such another great season, I was so inspired by and the wonderful participates and the amazing rooms. I am already thinking about what I can do for the fall…so I am completely hooked. 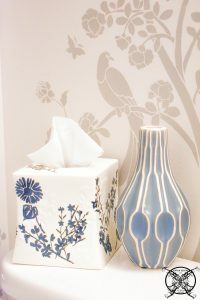 The stenciling in this room is beautiful! And thank you SO much for sharing that lighting trick. 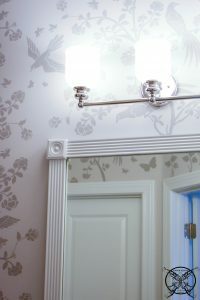 I would never have thought to turn the light fixture upside down in order to get more light in a room! I am so glad you participated in this round of the challenge! What an awesome space you have (I mean, not the worst place to get locked in 🙂 ). P.S. I want your office! It’s gorgeous! What a fun design contest. I like the budget, it is so obtainable. This is fun. Amazing rooms. That stencil is everything! It makes the whole room. And the ceiling looks amazing. Congrats on a great job done! Wow! I really love the touches on the ceiling. It makes it really stand out! Wow, such a dramatic difference! I am just loving the walls! Great job! Your $100 Room really turned out wonderful and looks like a million bucks. I must say this is a really fun challenge and I really enjoyed it. Great job. so well done and $5 under budget at that! woo hoo!! 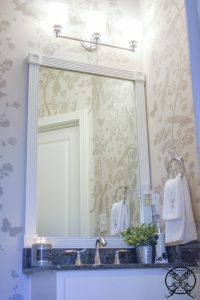 This is such a cute bathroom! Great Job! Such a great wonderful design challenge to showcase the abilities of truly creative individuals you and all the ladies did a wonderful job, bravo! Wow!! 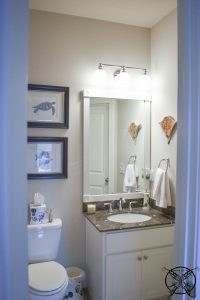 How impressive you did that much in a small space and it looks amazing!!! This space looks stunning! I definitely would have expected this result to cost much more had I not followed along! 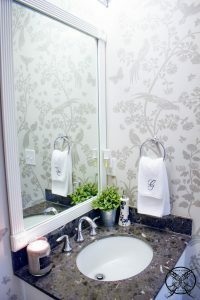 I love the two tones of paint in the stencil and how it coordinates with the sink countertop and the rug. Nice job! Niceeee…I am loving the reveal!! The space looks totally amazing. Oh my goodness Lindsey, thank you so much. I am pretty sure that I am blushing after reading this comment, lol. It really was a fun challenge and the creativity and friendship that it develops’s just adds to the entire experience. The space looks great! 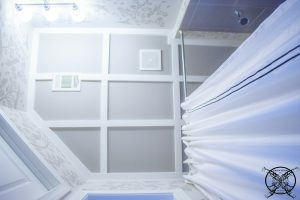 I love the ceiling and definitely want to try that in my bathroom! I’m so impressed and inspired to try something similar now. The room is so warm and homey! Wow. Great work. I really love the walls with the bird print. It is so gentle and clean. Impressive! 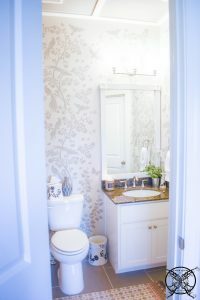 How exciting to see this bathroom finished, it looks gorgeous with those patterns and the color palette itself! Unbelievable you made it with under 100 dollars! Oh my friend you have don it again, another beautiful creation, and another jaw dropping reveal. You really inspire me that home design does not have to be expensive to be beautiful. 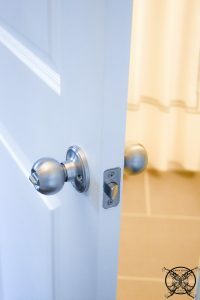 The picture of the door knob made me laugh! I can’t believe how amazing that stencil turned out on the walls! Looks beautiful! And I love how you mentioned, shopping your home. My mom says that & I think it’s a genius idea! I LOVE IT ALL! This is really an amazing transformation for only $100, you are so talented. 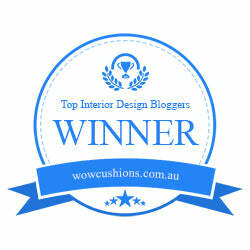 I know some bloggers that spend that on just a pillow, yet you gave us an entire room of inspiration. It really showcases your design talent since anyone can press a button and buy stuff, you actually created a room from nothing. That ceiling is so beautiful!! Great transformation! Wow wow wow that is all I can say, you make $100 bucks look good, I am not sure I could say in those perimeters and have such a good looking result, I mean that ceiling alone it beautiful. 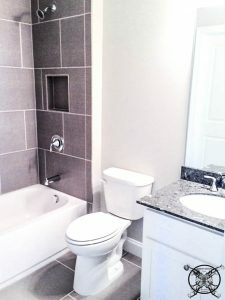 You made a builder grade boring , but still nice, bathroom look special and unique. And I love it! The ceiling is my fave! Such a beautiful Room. Such a feast to eyes . So good!! I can’t believe you did all that and totally changed up the room for $100! 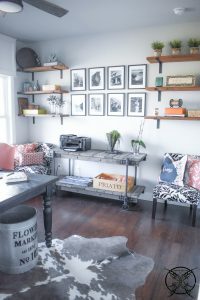 Love the stencil, ceiling treatment and how you styled it all! What a fabulous space! Love the stenciling and that ceiling!!! So elegant and impressive! Great job!!! This transformation is amazing!! I think my favorite part is the wall stencil!! It’s just GORGEOUS! Thank you Patti we are loving are new space. Seriously love this reveal!! Incredible job, I know you’re already loving your new space! So pretty and feminine but not too much. 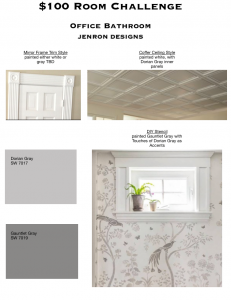 I do adore that bird print and your ceiling work is something I never would have thought to do. Pinning.